Arriving just in time for the gift-giving season, Alpha And Omega 2: A Howl-iday Adventure brings a new breed of excitement to your holiday celebrations. The sequel to the hugely popular family animated feature film Alpha And Omega, this brand-new wilderness adventure introduces us to Kate and Humphrey's new cubs and reminds us about the importance of family. Alpha And Omega so popular. While their adventure does not end exactly as planned, in the end Kate and Humphrey discover that for the holidays, "Home is where the family is." 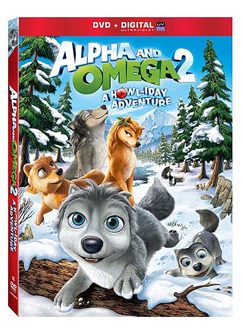 The Blu-ray Combo Pack and DVD, containing all-new special features that include a behind the scenes look at the making of Alpha and Omega 2, fun wolf trivia and an "Are you an Alpha or an Omega?" quiz plus a sneak peek at future Alpha and Omega adventures. Alpha and Omega 2: A Howl-iday Adventure is available exclusively at Walmart locations nationwide for the suggested retail price of $24.99 and $19.98, respectively. This giveaway will end November 21st at Midnight EST. 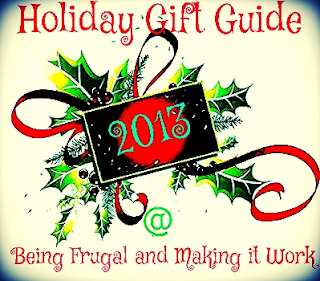 Disclaimer: The Being Frugal and Making it Work family received complimentary Alpha And Omega 2: A Howl-iday Adventure Blu-ray Combo Pack for the purpose of hosting a giveaway. Regardless, I only recommend products or services I would use personally and/or believe will be a good fit for my readers. The views and opinions expressed on this blog are based purely by our own experiences. No monetary compensation was received. Results may vary. My favorite movie is It's a Wonderful Life. We try and watch it every year! My favorite holiday movie is Frosty the Snowman, it will always be a classic and fun to watch. My family and I love to watch It's A Wonderful Life. We never tire of watching it every year. I love Dreamworks Christmas and Halloween specials with Monsters vs Aliens, Shrek and Madagascar. They are on netflix and worth watching! My ultimate favorite holiday movie that never gets old, no matter how much I watch it, is The Christmas Story, I even watch a lot of it on the 24 hours of it that runs every year. Such a great story! Home Alone.. I have really good memories watching this movie with my mother. My favorite holiday movie is The original Grinch movie (cartoon one). It is a classic, and one that I have to watch every holiday season! I love the movie Elf! We watch it every year and it always makes me laugh out loud. I always liked the old classic, Charlie Brown Christmas, It's a Wonderful Life and the Christmas Story. My favorite holiday movie has always been It's A Wonderful Life. I just love the story and the characters, and it always makes me cry. *Love, Actually* is probably my very favorite holiday (Christmas) movie. It's so sweet and funny! i love a christmas story. my sister and i watch it all the time during th eholidays. The Santa Clause movies with Tim Allen are a favorite. I remember seeing the first two in the theater with my parents when my dad's company would sponsor a Christmas event for the employees. They paid for the employees and their spouses and children to see a movie at the mall, get popcorn and drinks, and then the kids got to visit Santa and get their pictures taken for free. My sister and I always got a sticking full of candy from Santa. So whenever I watch the first two, it reminds me of my childhood and happier times when my parents were still married. Four Christmases is a favorite holiday movie of mine. I like Reese Witherspoon and Vince Vaughn in all of their movies. My favorite holiday movie is The Nightmare Before Christmas. I like how it takes 2 different holidays into one. My favorite Christmas movie is A Christmas Story. My favorite scene is the pink bunny suit. My fave holiday movie is National Lampoons Christmas Vacation. I watch it every year and it never gets old. This is a tough question because they're so many favorite holiday movies. I'd say Charlie Brown Christmas and The Grinch are our top two favorites. Disney Christmas Carol, with Mickey, is a fave too. My favorite is A Christmas Story. My family enjoys watching it each year on Thanksgiving weekend. Thanks for the chance to win! I have four girls and our favorite holiday movies are How the Grinch stole Christmas (the Ginch as my twins say) and the Polar Express. We actually watched the Polar Express twice today. I am not sure who loves it more my kids, my husband, or I. My favorite holiday movie is a christmas story. I watched it when I was a kid with my parents and now my kids watch it with me. We usually watch "Its a Wonderful Life" together as a family. I love traditions that carry on with my children. I have two favorite Holiday Movies "A Christmas Story" and Rudolph. Loved them both since I was little. I like Christmas Story... we watch it every year and love it. It's such a classic!